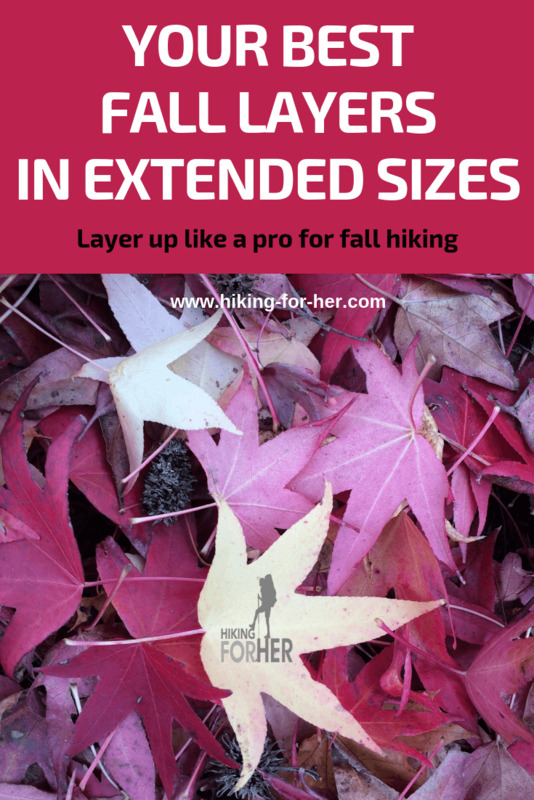 Are you a female hiker seeking the best extended size layers for fall hiking? Here they are, just waiting for you to give them a look. And to make your shopping (and shipping) experience fun and easy, let's visit REI Co-op's selection of plus size layering pieces for fall hikes. Hiking For Her is an REI Co-op affiliate, so when you purchase using this website, HFH receives a small commission. You pay nothing extra, and I have the comfort of knowing you're in good hands. To save time, I pulled together the best of the best extended size layers for fall hiking for you, using REI Co-op's excellent website and detailed product descriptions. Be sure to read the REI Co-op customer reviews for even more insight into whether or not this clothing works well for your body type and hiking style. What you wear against your skin is your base layer. Want to start at the absolute beginning? Time for some sports bras and undies that work hard for you on the trail. For your convenience, the names of the items are in blue. Unicorns are easier to find than a decent sports bra. Here are some hints about hiking sports bras in extended sizes. You're on your own for the unicorns. Now that you've got support up top, and the right fabric to wick your sweat, it's time to start the actual layering process. In chilly hiking weather you have a decision to make for your legs and hips: do you need an extra layer underneath your hiking pants? Here's a slightly different design to accomplish the same big hiking goals you expect in a base layer: flexible fabric, moveability, and moisture wicking. Repurpose your summer hiking shorts by adding a base layer beneath them. Here's a worthy combo: The prAna tights mentioned above paired with REI Co-op Active Pursuits Shorts. The shorts feature sizing through 3X in breathable wicking 4-way stretch polyester. The flat seams, stretchy elastic waistband, hand pockets (one of them zips shut) & easy pull on style give you good things on the trail. So what makes a good top base layer? You definitely want softness and the ability to pull a shirt on and off quickly and easily, so skip buttons and other closures. A relaxed neck line will help with this, and provide room for a soft fleece scarf on particularly chilly trails. The fabric needs to be moisture wicking and fast drying, to handle the sweat you're going to be generating as you hike - think armpits and waist. And long sleeves for fall hiking just make sense, especially if you can push or roll them up if you get too warm. How about this Smartwool Merino 250 Base Layer Crew Top hiking shirt? A hiker can never have too many pieces of Smartwool technology in a layering system. This fabric is absolutely bombproof! So don't hesitate to invest in base layers from this company. If you skip a base layer and go straight to an outer layer to cover your lower half, be sure they're the right weight for your hiking style. Here's a light weight nylon option that would work well even if you change your mind about hiking with a base layer: REI Co-op Sahara Convertible Pants in sizes through 3X (26W). Plus they're convertible, so you can use these for summer hiking trails as well - earning them an even more worthy spot in your hiking wardrobe. Not interested in a base layer beneath your pants? These are suitable for later fall hikes when you know you'll be facing wet vegetation along the trail (or IN the vegetation during pit stops). Or when you sit on the damp ground, scramble over saturated downed logs ... you get the idea! You want to stay dry whenever you contact something wet, right? These are the pants for you! If you decide to layer tights or leggings beneath your pants, be sure you size up appropriately. The crotch and leg gussets noted in the pants above will really help you out with retaining free movement while trapping body heat in windy or wet conditions. It's hard enough to find high quality hiking pants in extended sizing, let alone petite lengths. At 5'3" I've had plenty of "ugh, too long!!" moments myself. Wear roll up pants and adjust the hem as needed for water crossings, boot sole height, terrain, or your mood. SHORT (petite) INSEAM: 30 inches regardless of waist sizes. Be sure to check the inseam data (when available, sometimes it's missing) before ordering hiking pants. Some women hikers like to keep the layering going on top by adding a versatile vest before pulling on a jacket, like this REI Co-op 650 Down Vest in sizes through 3X. Love the big pockets for stashing snacks and a hat! "650" fill power refers to the ability of the down to trap and store your body heat; this is a good weight for fall hiking. In mildly cool conditions, you'll be able to rely upon this vest to keep you warm, without resorting to a jacket. Also looks nice enough to wear around town, don't you think? Another option: pull on a lightweight hoodie over your base layer shirt for full torso and arm coverage. This REI Co-op Active Pursuits Hoodie has more going for it than a hood! Some hikers prefer to jump straight to an outer shell jacket layered over their base layer shirt. Here's where technical features really make a difference. This REI Co-op XeroDry GTX Jacket, sizes through 3X, is worth a look. And it pairs nicely with the REI Co-op XeroDry GTX Pants you saw above. REI Co-op Rainier Rain Jacket gives you pit zips. Always grab a jacket with pit zips when you know you'll be sweating up a storm (especially if you're hiking through one). We've narrowed down the best extended size layers for fall hiking. But it's not really the end. Lots more plus size hiking clothing tips for you! P.S. You want warm hands on a chilly hike, don't you? Keep the cold at bay with these tips.